Dhaka, 25 September, Abnews: Prime Minister Sheikh Hasina has urged the world leaders to settle all international disputes and fight emerging global challenges like terrorism. 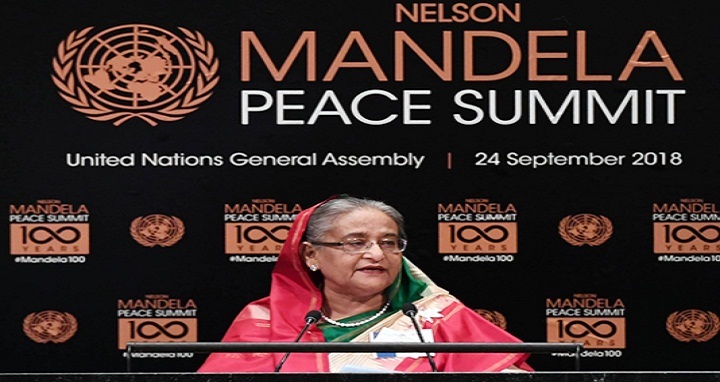 “To ensure a peaceful world in future the world leaders must be commited to settle all international disputes through peaceful means and prevent conflict in all circumstances as yet peace is eluding,” she told the Nelson Mandela Peace Summit held at General Assembly Hall at the UN Headquarters here on Monday afternoon. The peace summit was organised on the occasion of the 100th birth anniversary of Nelson Mandela, a South African anti-apartheid revolutionary, political leader, and philanthropist who served as President of South Africa from 1994 to 1999. Sheikh Hasina also said that the world leaders must fight emerging global challenges like terrorism, through stopping the flow of financing to the terrorists, and the source of supply of arms to the terrorists and their outfits. “We’ve to fight climate change and built upon resilience, promote and protect human rights in any circumstances and nurture culture of peace and non-violence,” she said. “We’ve to strengthen also cooperation to achieve sustainable development goals, promote tolerance, preserve diversity, protect the religious and ethnic minorities from discrimination and exploitation,” she added. The Prime Minister said yet, peace is eluding us and conflicts are far from being resolved, while human rights and fundamental freedoms, which leaders like Mandela fought for, are yet to be secured. “People in many parts of the world are suffering from hunger and malnourishment,” she said. Noting that racism, populism and intolerance are on the rise, Sheikh Hasina said the people in many societies are facing discrimination, forced displacement, torture and even genocide due to their ethnic and religious identity. In this connection Sheikh Hasina mentioned that over one million Rohingyas have taken shelter in Bangladesh to evade ethnic cleansing in Myanmar. She said that Bangladesh is committed to global peace since its independence in 1971. The peacekeepers of Bangladesh are saving lives in many parts of the world, she added. “We cooperate with the international community in sustaining peace through conflict prevention, development and promotion of human rights. Bangladesh has introduced the culture of peace resolution in the UN General Assembly since two decades,” she said. After successful implementation of Millennium Development Goals, the prime minister said, international community has adopted the Agenda-2030 in 2015. “The agenda for sustainable development encompasses on aspects of human life – from hunger to inequality,” she said. Sheikh Hasina said that the vision of Father of the Nation Bangabandhu to establish peace has guided us all along. “Our investment in poverty alleviation, public health and education has allowed us to ensure wellbeing of our people and reduce inequality. We have created opportunities for individuals through innovative means and thus established peace through socio-economic development,” she said. Talking about the life of Nelson Mandela, she said that he began his political life as a leader of his people to fight apartheid in South Africa. Later, with his sacrifice, dedication, compassion for people, he became the undisputed leader of the humanity and peace, freedom, unity those have been his life-long mantra. She mentioned that Bangabandhu was sent to jail time and again from 1948 to 1971 and while in prison he wrote diaries and a number of books. The premier said the biography ‘Unfinished Memories’ and ‘Prison Diary’ written by Bangabandhu have recorded his struggle for peace and a just life for his people, like the ‘Long Walk to Freedom’ by Nelson Mandela.